NGC 6992, the Eastern Veil Nebula is a large supernova remnant in the constellation Cygnus. The oxygen, sulfur, and hydrogen composition of this nebula make it a popular choice for deep sky astrophotographers capturing images using narrowband filters. 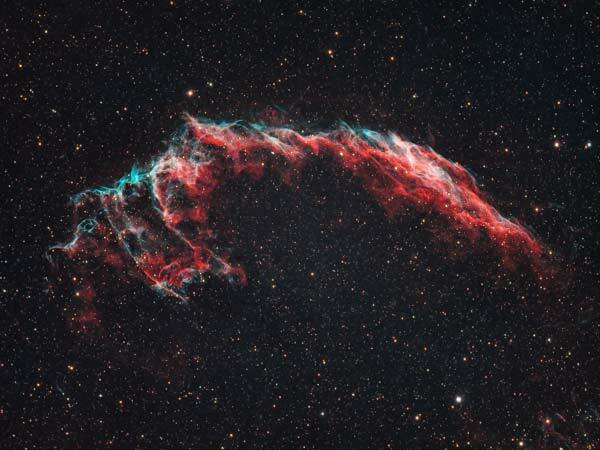 The image below shows the Veil Nebula using a one-shot-color camera and a duo-narrowband filter. 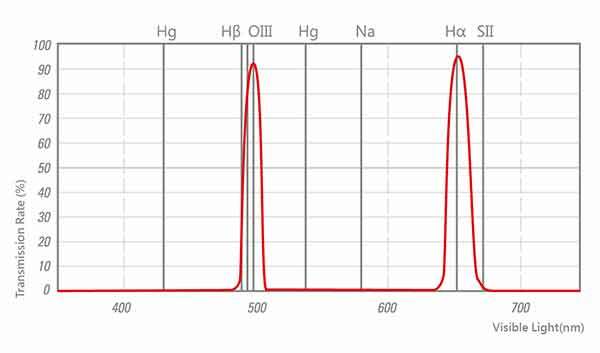 This filter collects light in both h-alpha and OIII simultaneously in a single exposure. The wispy filaments of the Eastern Veil Nebula are a part of a larger overall network of nebulae in this area of the sky, called the Cygnus Loop. The Western Veil Nebula is equally as stunning as this target. The image above was captured from my light polluted backyard (Bortle Class 8) during the night of the Full Moon. A photo like this from home seemed impossible to me when I first began taking deep sky astrophotography images from my backyard. This photo is a testament to the power of filters when imaging under heavily light polluted skies. 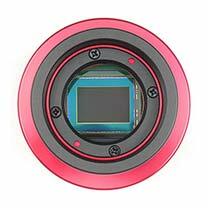 The camera used for the photo shown below was a ZWO ASI294MC Pro, a cooled one-shot-color CMOS camera. The 294 is a great fit for wide field refractor telescopes like the Explore Scientific ED102 used for this shot. 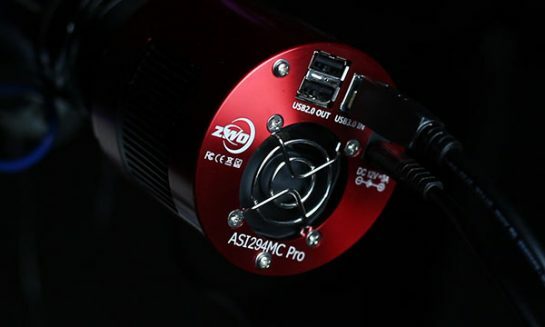 A cooled camera like the ASI294MC Pro is an excellent choice for narrowband astrophotography from the city. This 10.7 MP astrophotography camera can produce images with a high dynamic range and an impressive full well capacity (63700e). The TEC (Thermoelectric cooling) feature of the 294 allows me to keep the sensor running at -10 degrees C or below on a hot summer night. This is very important when collecting long narrowband images of 5-minutes or longer. It’s remarkable to me that my latest photo taken from the backyard is actually better than my previous version from a dark sky site (during New Moon!). Narrowband filters make what once seemed impossible to me a reality. The STC Astro Duo-Narrowband filter is one of the most incredible filters I have ever used. The effectiveness of this incredible narrowband filter is well represented in my photo of the Eastern Veil Nebula. The gases that make up this nebula jump off of the screen. I photographed the Eastern Veil Nebula again in October using the ASI294MC Pro camera, this time through the Sky-Watcher Esprit 100ED. It was also the first image captured using my new telescope mount, the Sky-Watcher EQ6-R Pro. 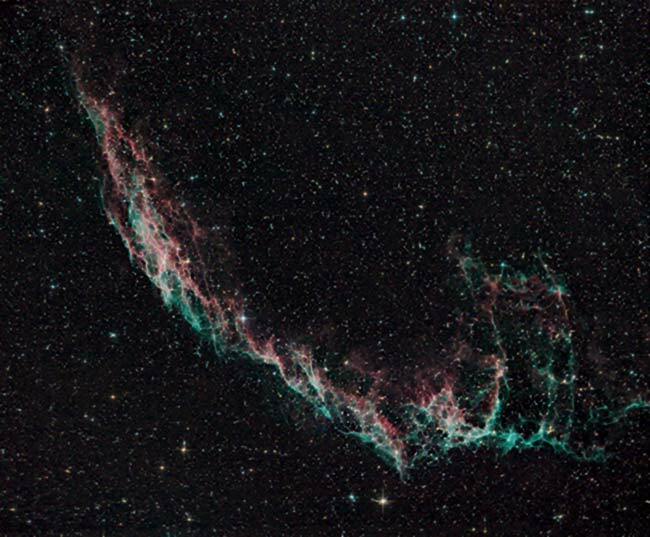 The Eastern Veil Nebula was the first object captured using the NEQ6-R mount, and it was a huge success. To see my latest version of this image that includes over 4 hours worth of integrated exposure time, you can view it on Astrobin. 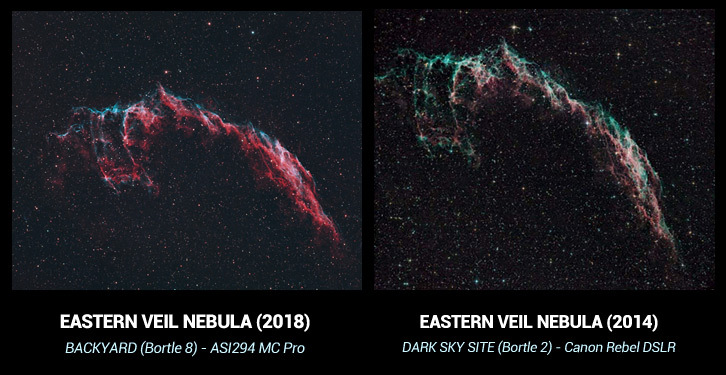 To capture the Veil Nebula (both eastern and western portions), I suggest shooting exposures of 4-5 minutes each, with a cooled camera and a narrowband filter. A 12nm Ha filter does a great job at separating the Veil Nebula from a busy sea of stars beneath it. A mono camera will collect more signal in each shot but will require you to collect light in each color and narrowband wavelength. It’s hard to beat the convenience of shooting with a one-shot-color camera with a duo-narrowband filter. A wide field refractor telescope is my preferred choice for large nebulae objects like the Veil. An Apochromatic refractor can produce crisp, high-contrast images of some of the most impressive objects in the night sky. To control the camera and automate the exposure sequence (among other things), I use an application called Astro Photography Tool (APT). 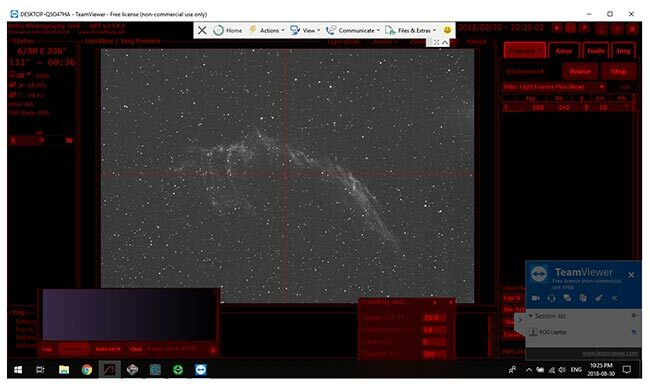 In the screenshot below, you’ll see what a single 5-minute frame looks like of the Veil Nebula with a narrowband filter in front of the camera sensor. As you can see, the single image frame needs a lot of processing to bring the details to the surface. APT lets me control all aspects of my image acquisition process. 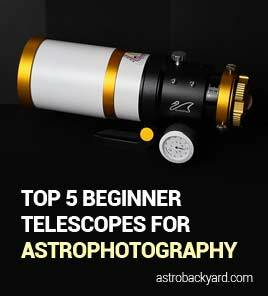 A cooled astronomy camera will allow you to shoot longer narrowband images without introducing too much noise. This is especially important when shooting images of 5-minutes or more, as an uncooled DSLR will often create more noise as the sensor heats up. My photo from this year uses 18 x 5-minute exposures with the ASI294MC Pro set to “Unity Gain”. The images were stacked in DeepSkyStacker using dark frames to improve the signal to noise ratio. The total exposure time for the Veil Nebula image on this page is 1 Hour and 30 minutes. The complete Veil Nebula complex (Cygnus Loop) contains three prominent deep sky objects, the Eastern Veil, the Western Veil and Pickering’s Triangle. I have photographed NGC 6992 (Eastern Veil) and NGC 6960 (Witches Broom) with my telescope, but have never attempted to capture the entire area in a single shot. Where is the Veil Nebula located? 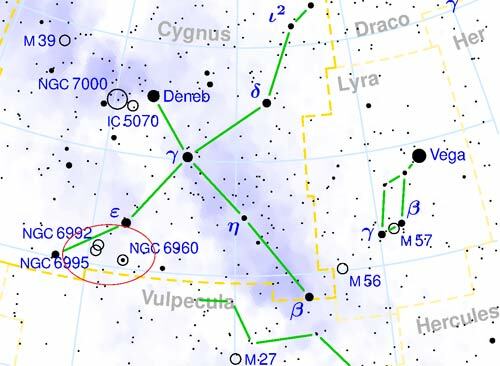 To find the Veil Nebula, start with Deneb in Cyngus. It’s one of the brightest stars in the night sky, and one of the 3 stars of the Summer Triangle. From there, work your way over to the left of the “Cross”. A computerized GoTo telescope mount will make finding the Veil much easier, but don’t expect to see very much of this faint Supernova remnant with the naked eye. The image below is an earlier version of the Veil Nebula from 2014. 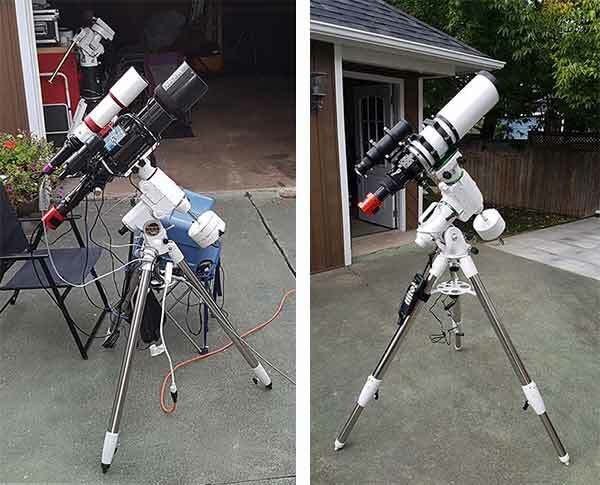 This version used an Orion 8″ Newtonian Astrograph instead of a refractor. I photographed this nebula from the extremely dark skies at Cherry Springs State Park in Pennsylvania. I spent two glorious nights at this astrophotographers paradise in June of 2014. For this photo, I used a modified DSLR camera through an 8″ Newtonian reflector. I do enjoy the diffraction spikes created using a reflector, but I think I like the crisp, consistent results of an Apochromatic refractor telescope even more. If you are interested in the equipment needed to capture images like this, have a look at this video where I break down each piece of the puzzle. 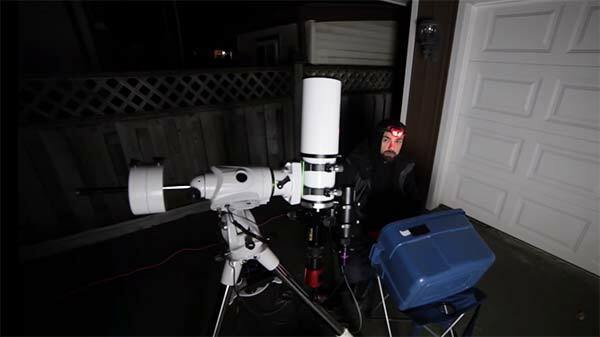 Deep sky astrophotography can be hard to comprehend at first, but once you can master the process – you’ll have a sky full of targets to photograph!